Years ago I woke to a rising sun with the geese flying across it. I immediately drew a sketch because I knew there was a quilt there and promptly forgot it again as time and circumstances got in the way. I always knew though that it would be a quilt and it stayed with me. When I began designing the quilt I did not think of the sketch. I had different corner blocks made, but was not happy with them. Then the idea of the sun setting in all four corners would be better. Several months after making the quilt I found the sketch while looking for something else. Not only was there a sun with the geese flying through it, but the sun setting blocks for the corners. The rising sun is made of small pieces layered onto a paper circle, then sewn with a crazy stitch on the machine. The setting suns were made the same way on smaller circles. 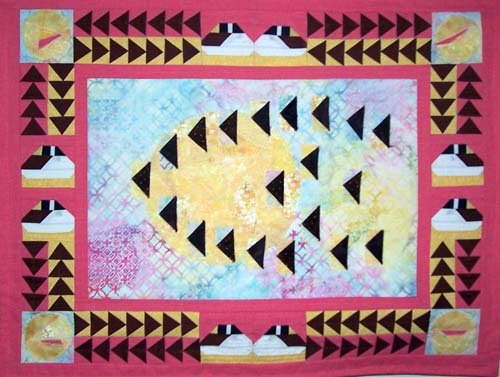 The resting geese are an original pattern and paper pieced along with the flying geese. 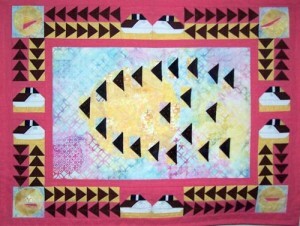 The quilt is 28 1/2″ wide by 22″ long. The resting geese are 3″ blocks.